You may be wondering; why should I invest the time to learn to cook when…a.) I can just go out or b.) someone will always cook for me? The power to select, prepare and present food is a unique human ability. The only times we are completely reliant on others for feeding is during infancy, illness, and advancing age. So the majority of the time, we are well capable of feeding ourselves. By learning to cook, you will enjoy a sense of independence that will allow you to tap into your likes and dislikes. You will create food you want to eat. You will know exactly what’s in it. You will appreciate the meal more because you made it yourself. Thoughtfulness and appreciation are the missing ingredients you simply can’t replicate in processed, pre-packed meals. You have the power to pick what goes into the recipe and in what amount. 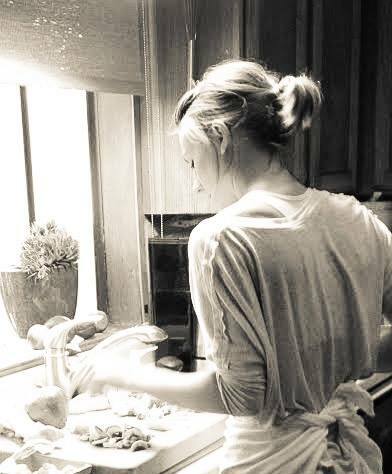 Because you made the food, you’ll know what’s in it and you will appreciate it all the more. There will be less waste (and more taste). Sure, the food you prepare may not be the prettiest (I make some pretty hideous kitchari but it’s still the bomb) and that’s ok. You’ll know that it’s made up of real food and your body will thank you. I get it. Life is busy and sometimes the last thing you want to do is be in the kitchen at the end of a long, hard day. But what if you learned to savor that time? You can make your time preparing food a pleasant experience. Turn on some tunes, pour a glass of wine, move slowly through the process, get the kids/family/friends involved (even on busy nights, it can work!). Also know there are tons of super easy, complete meals you can make on the fly with minimal ingredients. I will be sharing some of my favorite go-to-recipes (I call them my fast food) over the next few weeks. Having tub of miso paste on hand will make you kick that hamburger helper to the curb! Cooking for others just feels good. It feels even better when you’ve honed a bit of culinary confidence. (Yeah yeah, of course, your friends and family will always love you, regardless of your kitchen skills but still). Eating is a social activity. Embrace it. By selecting each ingredient that goes into a meal, I bet trans fats, hydrogenated anything, yellow #5, Acesulfame-K, Butylated Hydroxyanisole, or Propyl Gallate won’t be on your shopping list. Recipe call for a decent amount of butter (keep it grass fed! Or try ghee if dairy isn’t your thing)? That’s ok! It’s a real food. Just don’t sub margarine thinking it’s healthier, for the love of God (and gut). When you go out to eat, you are not just paying for the meal (which might be made with low quality, cheap ingredients anyway). You’re also paying for the seat, the ambiance, the hostess, the parking spot, and the food preparation and clean up. So, why not make a night out a special event? Instead of turning to dining out when you are utterly exhausted and just “don’t feel like cooking,” go out to eat as an event. Pick a restaurant that serves good quality food. Enjoy it- don’t make it a last resort habit. The thoughtfulness that goes into cooking naturally discourages waste. You took the time to make the food so your leftovers are more likely to be eaten and not fed to the dog. It’s impossible to be bored (in food and in life). There is always something to do, learn, explore when it comes to cooking. Seek stimulation, don’t just throw your hands up when you don’t feel entertained anymore. By stepping into the kitchen, you stimulate your brain because chances are, there’s some new technique or skill out there you haven’t yet tried. I’m not saying you have to tackle Sous vide, a consommé or soufflé but perhaps try to master the perfect scrambled egg (there are different methods, did you know?) 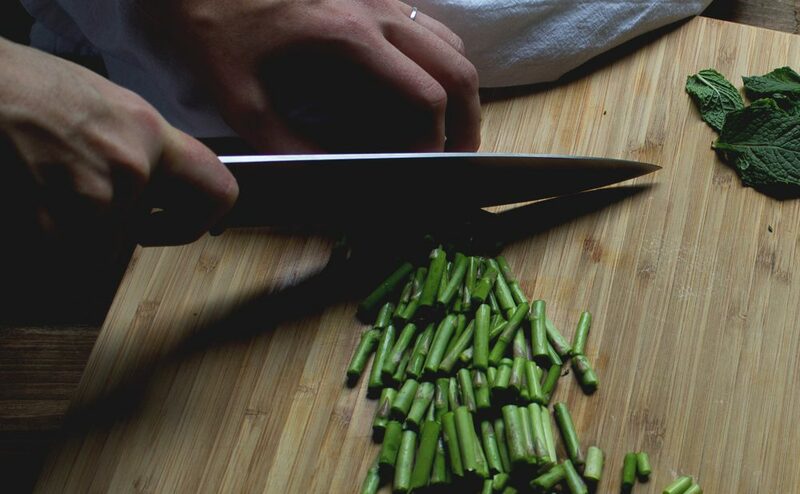 or brush up on your knife skills with some produce you have laying around. Then, you get it eat it! This may seem like an obvious benefit but think about it. You can cook food with only the things you like, every time. Of course, you can also try new recipes and find out you totally dig something you never thought you would (I used to think I hated mushrooms until I got my mitts on some wild mushrooms in Big Sur. Like, whoa.). But sometimes you may not always want to be adventurous, and that’s ok. Eat what you like! And last but not least, it’s fun! Playing with food is awesome and so rewarding. Along the way, your relationship with eating will improve as well. You will appreciate your meals for what they are; the time, the preparation, the ingredients. You will begin to allow yourself to really enjoy the eating experience. It forces you to slow down, life isn’t always about the hustle. And taking care of yourself shouldn’t be rushed. Tell me, do you geek-out over cooking? Or does it make you cringe? Have you taken any cooking workshops (if so, I’d love to hear about it!)? « What’s your relationship with food? You found my little space of the internet! SoulBeet is all about fostering a healthy relationship with food that nourishes your body and soul. A bit of science, a touch of technique, some pretty things thrown in, and a whole lotta self-love. I'm so happy you're here!